Monday was spent with friends at Newport Wetlands. We searched out the lighthouse (and followed the Alien Hunter trail for part of the way), not that the children were overly interested in it! They were more interested in the bugs they could find, the ducks they could see, the grasses and flowers they could find along the way! 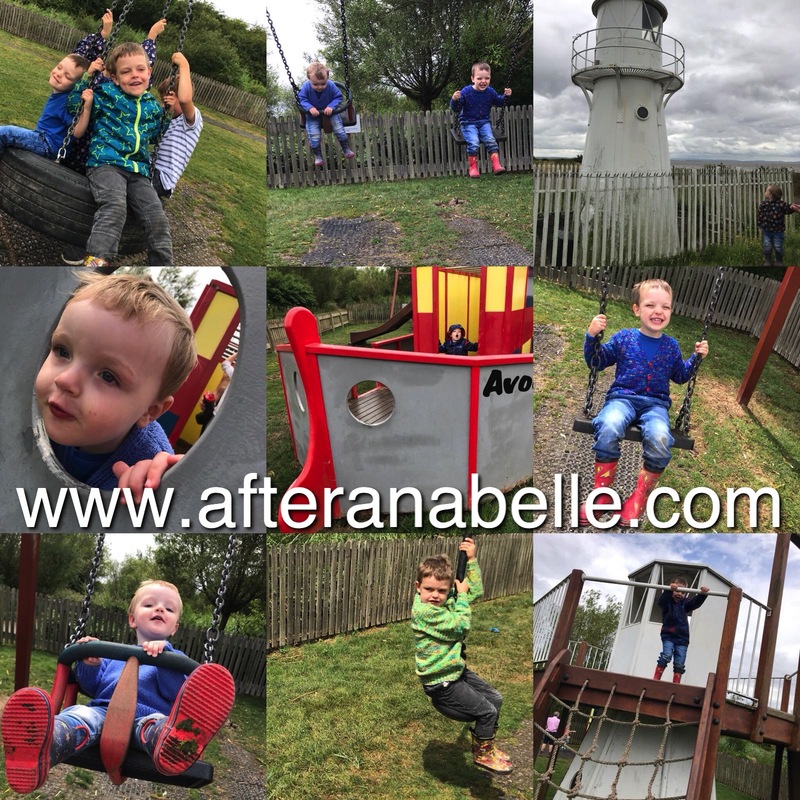 They had a lovely time with their friends from church and they all played and explored beautifully together. 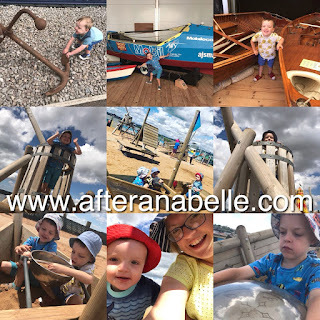 They had lots of fun in the boat and lighthouse themed park (while dodging some pretty heavy showers and sheltering in the lighthouse!) where they got stuck in to self-initiated boat themed role play. Zac's boat ran out of petrol and he had to go and tell the Captain! After a day finding a lighthouse the bedtime story had to be The Lighthouse Keeper's Lunch. I have fond memories of this book all the way back from when I was in Reception. I remember a pulley system across the classroom from a lighthouse to a cottage with a basket of goodies travelling back and fore across above our heads! World of Boats was very disappointing (although free), only less than half of it was open which meant the boys saw a grand total of about 10 sailing row boats and one larger across the ocean type racing sailing one. It all kept their interest for a grand total of 10 minutes and it was quite disappointing there wasn't a single boat they could sit in or have a go at rowing with. They were all very interested in the anchors on the walkway to the entrance though. It was our 9th wedding anniversary and back a few months ago we had hired a canal boat for the day. It was brilliant and I would definitely do it again in a few years. 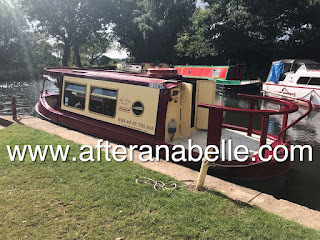 We sailed from Goytre Wharf southwards, stopping at The Star Inn for a pub lunch (which was brilliantly cheap - 7 meals, a little over £40) and then sailed back again. 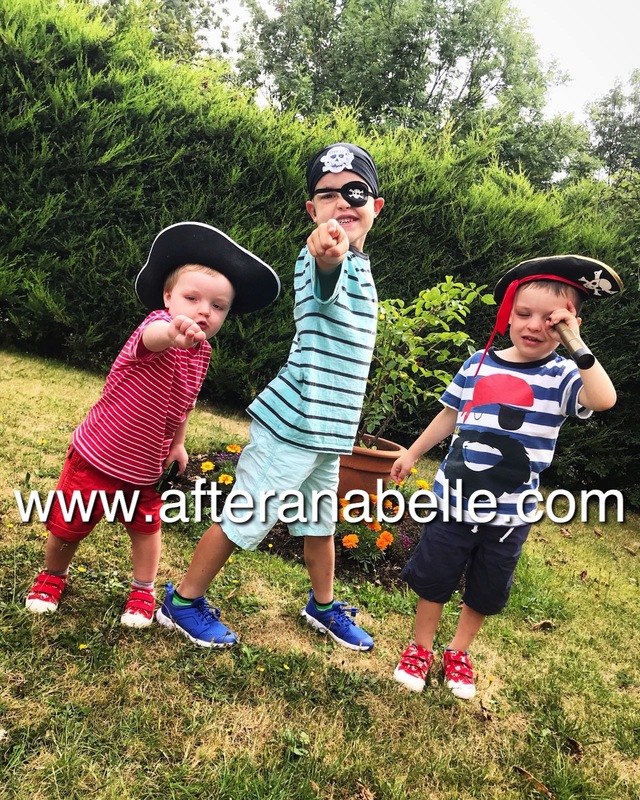 It was just a brilliantly relaxed day and the boys really got into the spirit of it enjoying being Captain and First Mate. 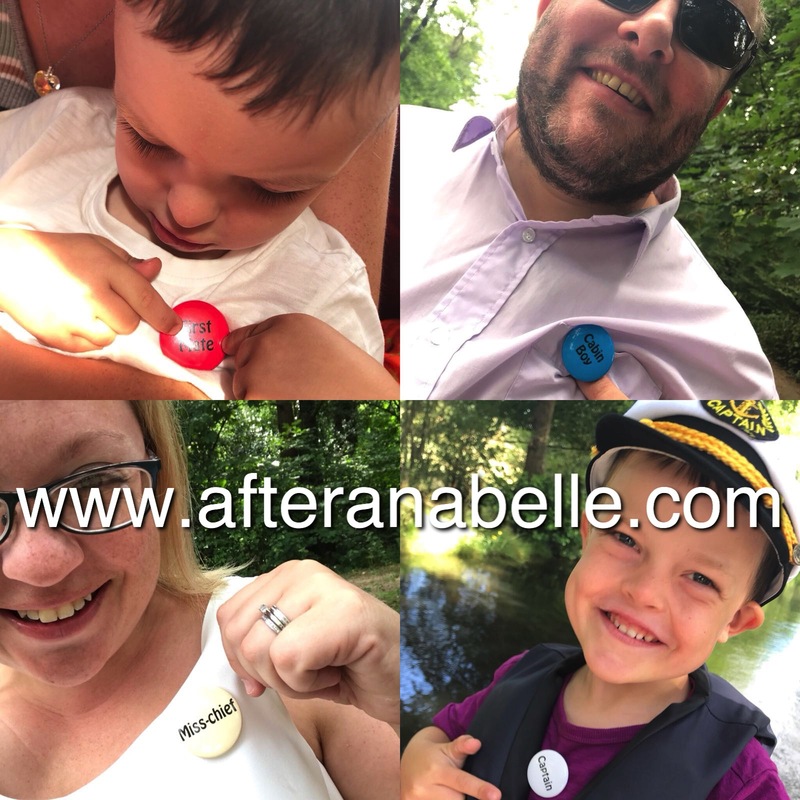 We all had badges with our ship roles on; Daddy Cabin Boy, Mummy Miss-Chief, Captain Xander, First Mate Zac, Pirate Bampi, Galley Slave Auntie Bex and Deck Scrubber Nana. I had felt really guilty today about leaving Luc behind in nursery but it was a good decision and the day would have been a very different atmosphere had he been there; the back of the boat was incredibly open and keeping him down from there when the other boys were up and down from cabin to deck all day would have been challenging! Zac felt liability enough on deck but they were ok, had life jackets on just in case and both had a great time steering the boat! We had a home day with our lovely school friends around for the day (Mummy friends and children friends included!) It was a good opportunity for Zac and his friend to get to know eachother better before they start Reception together in September, and Xander and his friend have been in the same class since Reception too. They were here literally all day but it didn't feel like it at all - the hours just passed with us not realising the time - don't you just love company like that! 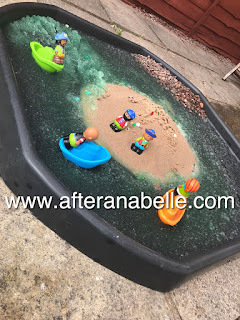 I set up a treasure island tuff spot for the boys to play in with a gellibaff sea, sequins hidden in the sand for buried treasure, a mountain of sand for the island, little plastic boats and Happyland Pirates. All the boys were all over it, and went back and fore all of the day. 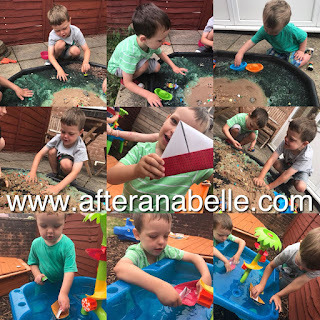 The older boys especially loved the sensory exploration play aspect of the tray and it wasn't that long before they had completely mixed the sequins into the sand and then the gellibaff into the sand so it was one big gooey mixture of mess. I really liked how sparkly and inviting it looked. 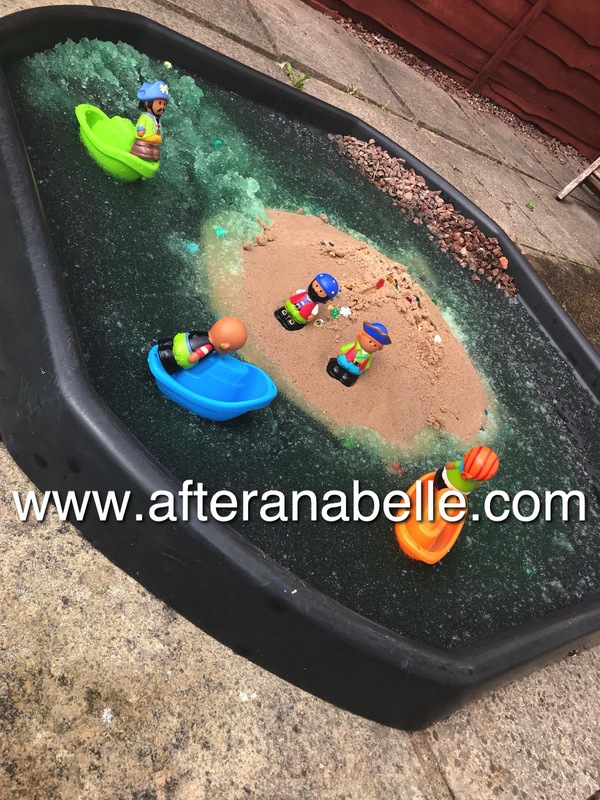 By late afternoon the two big boys were adding extra water to the mixture and making it as messy as possible. We also had a go at making some oragmi boats (which turned out to be a lot harder than it looked! Just as well my friend was here because she was a lot better at the final product than I was!) and then setting them off to float in the water tray. 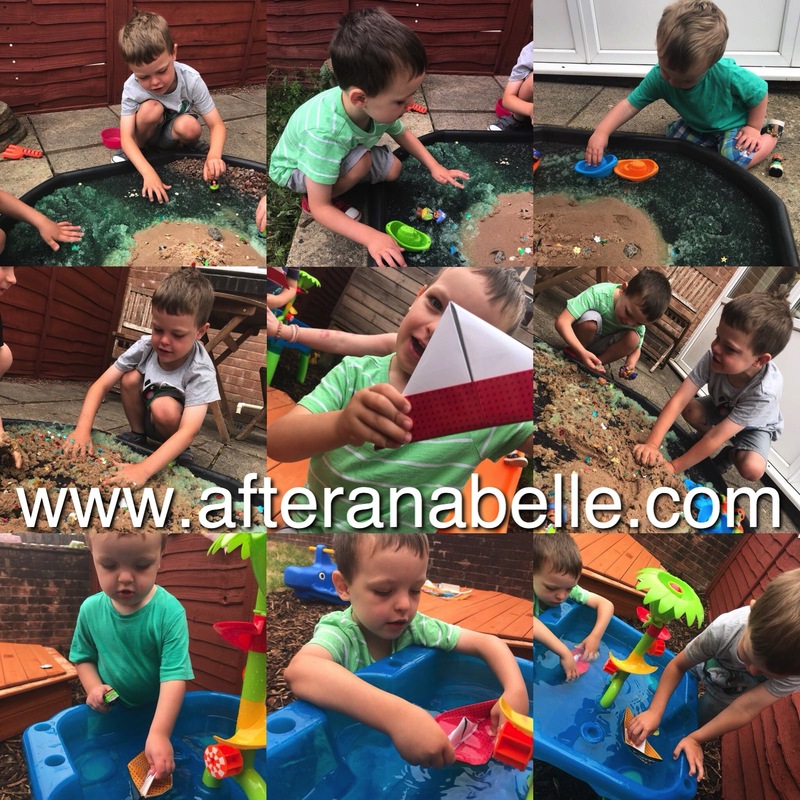 Just a really lovely garden play day! 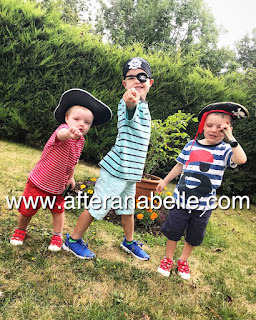 I had booked the boys into Pirate School in Swansea Waterside Museum on Friday and we left home completely looking the part. In the main hall of the museum there was a mock up pirate ship for the children to play on which all three boys really enjoyed, although I couldn't persuade any of them to put on the beautiful golden captain's jacket for a photo! Pirate School itself had so much potential to be amazing, and the session itself was good (although maybe a little too long for Zac but it was advertised as suitable for 5+ with him being a young 4) but we were unfortunate to have ended up sharing a session with a large playscheme group who were all wearing fluorescent jackets. This meant the few children who were there from the general public (all of whom were younger children) got lost in the crowd of fluorescent with the playscheme children recieving all of the attention and dominating the session. My boys quickly lost interest with Xander announcing it was all boring. 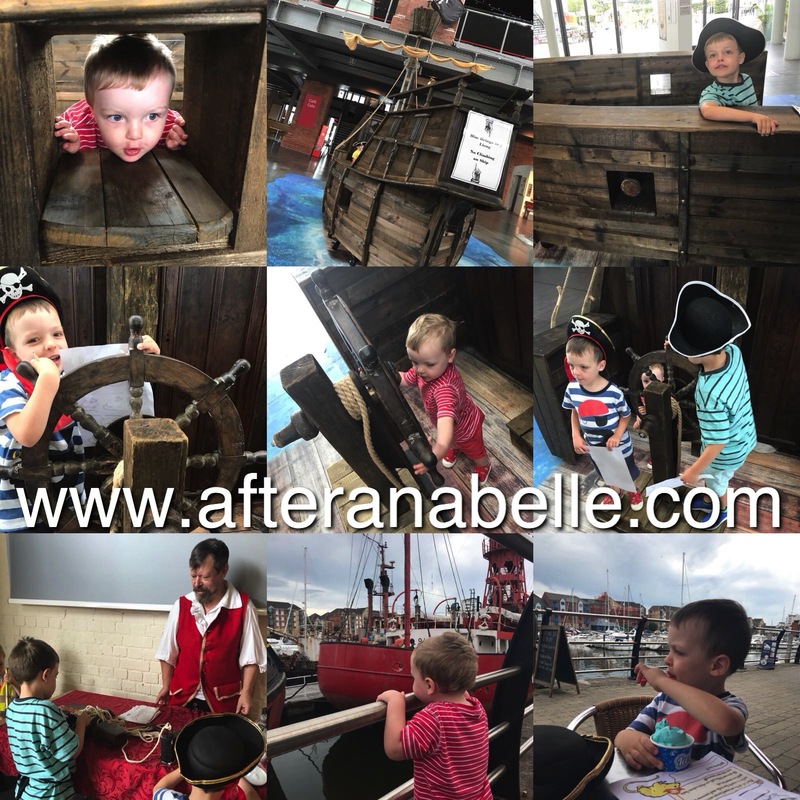 Although I did catch him sneakily laughing at some of the tales and he did enjoy being able to handle lots of pirate / sailing artefacts at the end of the session. 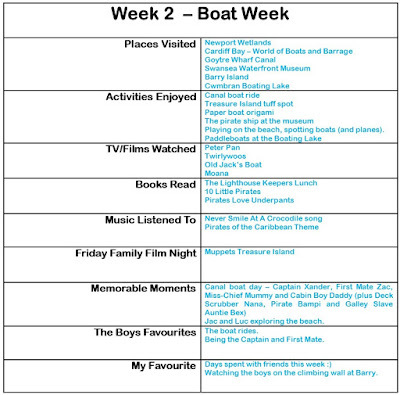 I will be emailing my feedback to the museum because it really was such a shame and I think the playscheme group could have been offered their own session rather than impinging on the general public - much like a school group would be. 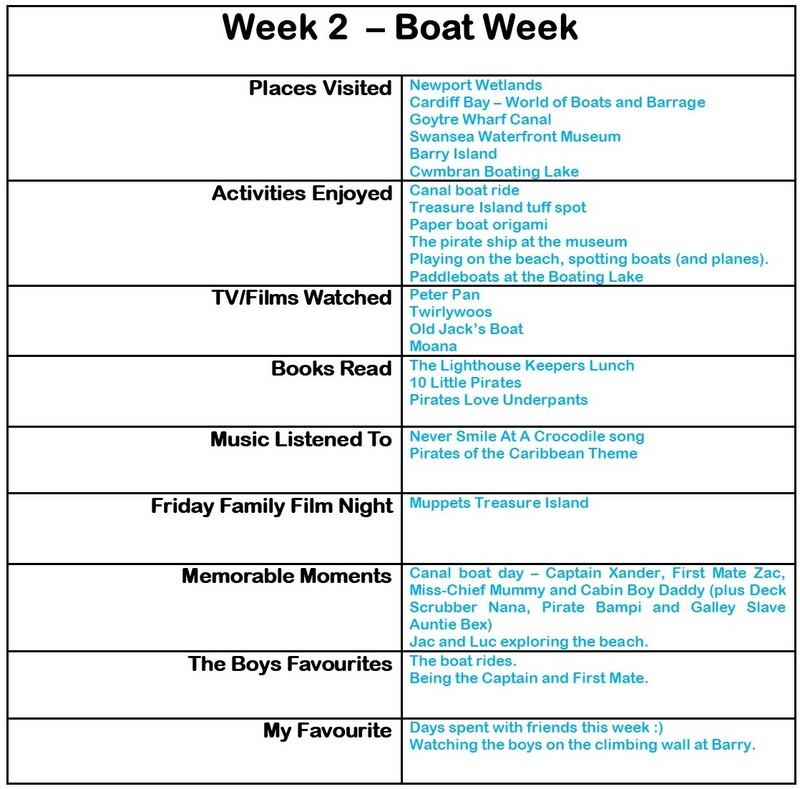 When I've asked Xander what his best and worst bits have been this week he very quickly said Pirate School was the worst. So a bit of a waste of fuel on the trip to Swansea but still, there was some good points too! 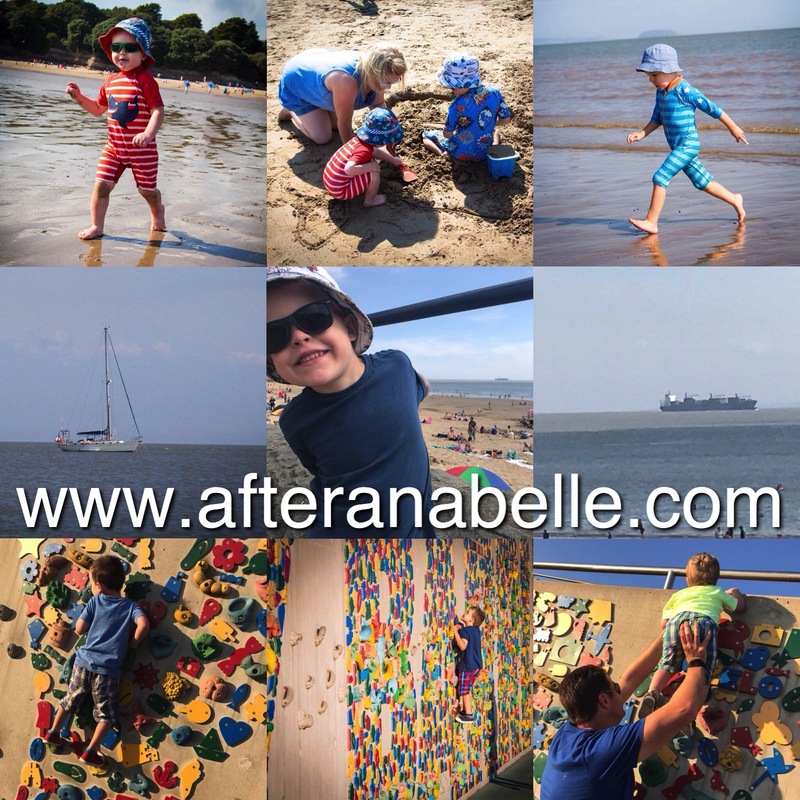 They enjoyed a little walk along the harbour wall to look at the boats and more ice-cream. We went back to Bridgend for a little shopping and a quick play in the dinosaur park which they all enjoyed. 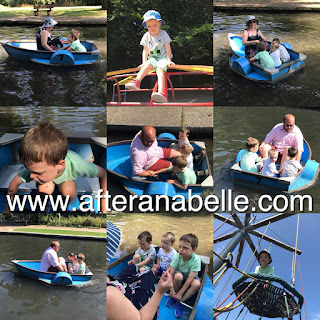 We had a lovely slow morning, followed by a birthday party of some lovely friends and then after the party we and the boys Godmother and her family went down to Barry. What a lush afternoon! Despite nagging to do the pirate crazy golf the last three time we've been to Barry and us saying no, today when we told Xander he could go on the crazy golf he decided he didn't want to! (Typical contrary child!) and we went straight down the sand. 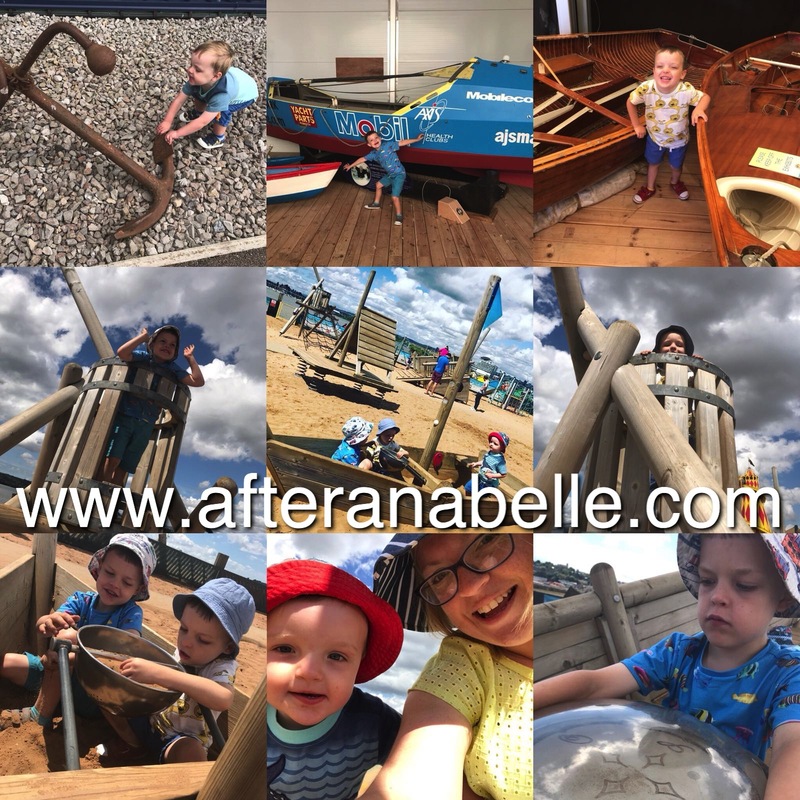 The five boys had a blast playing on the sand, building castle, going down the sea and were so well behaved all afternoon - another one of those days where the hours just flew by and we didn't really notice. We didn't leave the beach until gone 6pm and by the time we had sorted out chip supper and then them play on the climbing wall we didn't leave Barry until gone 8pm. A late night but totally worth it. Today has been a quieter day but we still fitted in a trip to the park this morning. We wanted to show the boys the model boat club that meet at Cwmbran Boating Lake on a Sunday morning but to be honest they were not really that interested and only briefly glanced at all the model boats on the lake. Instead they were much more interested in riding their bikes! 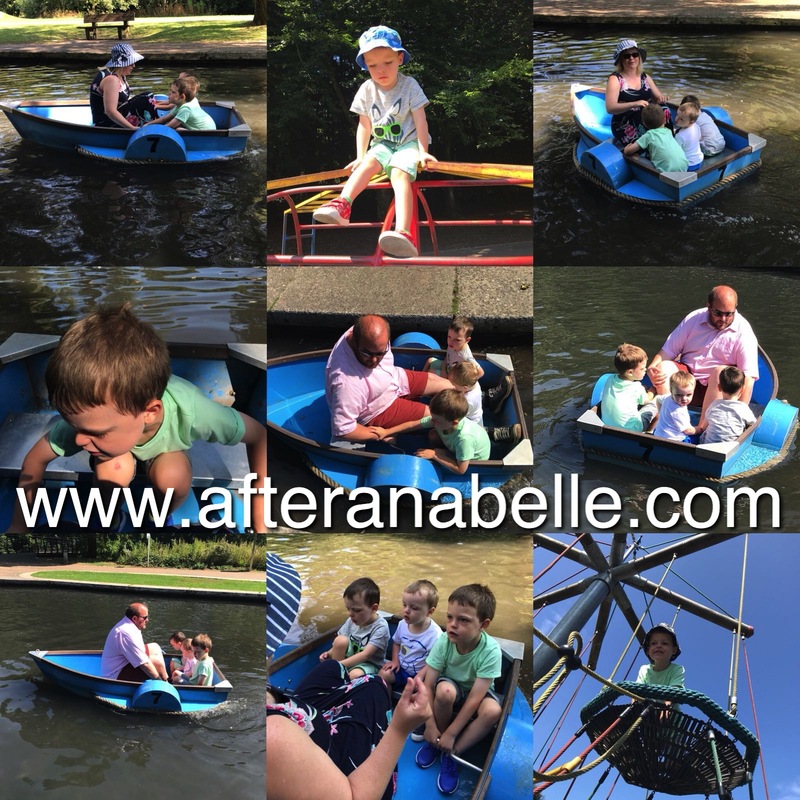 Before we got to the playground, we hired one of the small children's paddle row boats on the small lake (pond!) 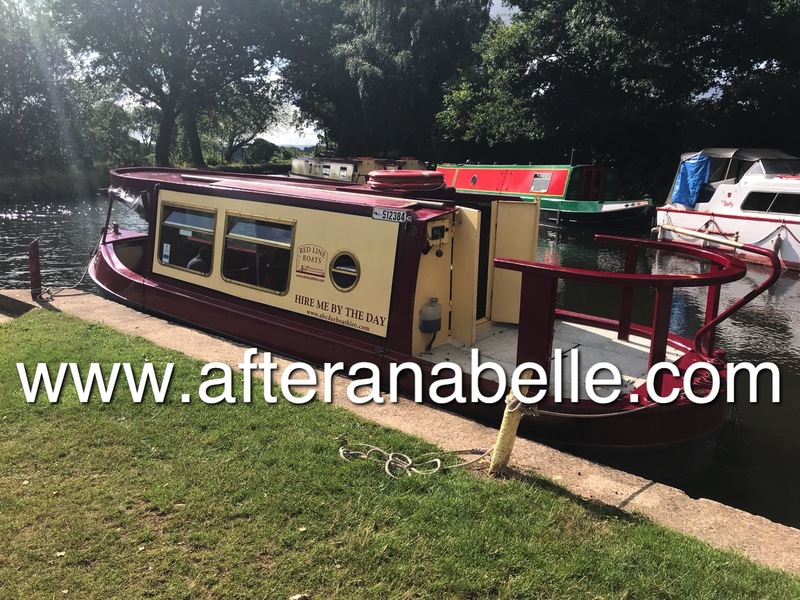 - these boats have been there for as long as I can remember and I asked today if they were still the exact same boats we would've have gone on as children, apparently they are! So at least 30 years old. It was only £2.60 for 20 minutes which was plenty long enough. Jon started off on the boat but I ended up swapping with him and Zac and Luc had had enough after 10 minutes. Xander stuck with me to the end though and felt very grown up being able to paddle the boat himself. 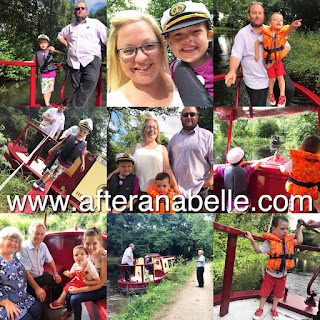 The rest of today we have visited Nana and Bampi, watched Moana, visited (Great) Grandma and then onto Nanny and Grandad (where we ended up booking another weekend away with them at the end of September!). So we're into Week 3! Wales and Welsh week. Jon is off this week so we have a day trip planned every day, we're going to check out the national Eisteddfod in Cardiff and a little trip down to West Wales in the Motorhome planned too!